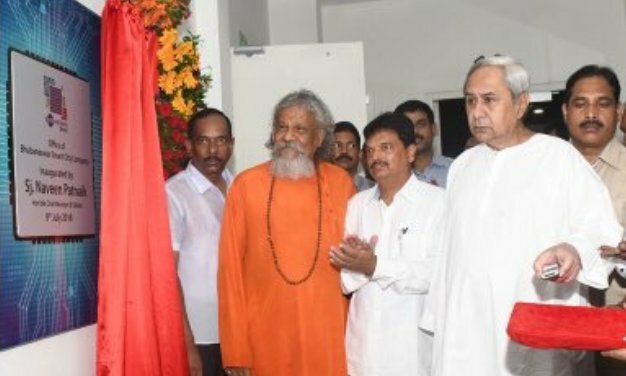 Odisha Chief Minister Naveen Patnaik inaugurated the Bhubaneswar Operations Centre and several other Smart City projects in Bhubaneswar on Monday. Inaugurating the command and control centre for the city and the new smart city office, he also laid the foundation stone for a Sensory Park for children with special needs in Saheed Nagar and an Integrated Public Service Centre (IPSC) at Bapuji Nagar. The Chief Minister dedicated the smart parks in Saheed Nagar and city-wide solar powered adaptive traffic signal system to the citizens of the temple city. “This will help in the services of the state capital operating more thoroughly,” he said. Bhubaneswar Municipal Corporation (BMC) commissioner Krishan Kumar said that the Bhubaneswar Operations Centre, which houses the traffic signal system, will control the street lighting system and address the problems. According to Bhubaneswar Smart City Ltd CEO Vineel Krishna, Rs 400 crore has been spent for several Smart City projects in the capital city. While the Central government has sanctioned Rs 200 crore, the state government contributed another Rs 200 crore, he added.